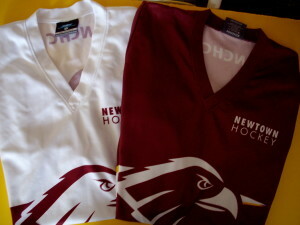 Newtown Hockey Club Day - Newtown City Hockey Club Inc. Celebrate the Maroon and White! Come and join the fun on May 30, and celebrate the fantastic club we are all part of. The sausages will be sizzling on the BBQ at Stead Park, and there will be some special treats and give aways too. If you need new socks or uniform, bring your money and you can buy what you need. Or pick up a Newtown coffee mug and a hoodie for those cold days on the sideline. Pick up your SportsPass card too. All players who have registered with Hockey Victoria will receive a SportsPass Card as part of their registration entitlement. Once you have activated your card, you will be able to receive great deals and discount offers from over 140 brands. And every time you use your card, you are helping to raise funds for the Newtown Hockey Club. Check out how this works on our Fundraising page. With 11 matches featuring Newtown Hockey Club teams on the agenda, there will be plenty of cheering to do. While our U8 and U11 players will play their matches as usual at Lloyd Reserve on May 30, we haven’t forgotten them. Our U8 and U11 players are asked to join us at Stead Park after their games finish, to run out with the senior teams at the start of their games. The first matches start at 9.15 with both the U13 Newtown Spirit and Newtown Strikers team on the pitches. The U13 Newtown Spirit team, with 6 players in this team who are still Under 11, has had some great results so far, and will be showing off both their skills and their fantastic work ethic. The U13 Newtown Strikers team are currently sitting in top of the ladder position, and will be playing against second placed team, Torquay Tornadoes, so we can expect a great contest. At 10.15, we see the U15 teams take the field, with Newtown Spirit facing up to Golden Plains, and Newtown Strikers against Torquay. Despite a somewhat unsettled start to the season, both U15 teams have performed very well. Newtown Spirit are clear leaders on the ladder and 2nd placed Newtown Strikers will have a great battle against 4th placed Torquay. The Under 17 Newtown Strikers team is up next at 11.15. Their opponent, Saints, will be looking to improve on their previous result against Newtown, who are comfortably settled in 1st place on the ladder. At 12.30, the Division 1 Women get under way, and Newtown Strikers will be looking to repeat their previous win against the 2014 Runners Up, Bellarine. The Newtown Falcons team follows on at 2.00 pm with a tough match against Geelong, who are dominating the D1 competition this year. At 2.00 pm on Pitch 2, the D2 Women Newtown Rebels takes on Saints. With a very close game between these 2 teams at the last encounter, and with some great form in recent matches, Newtown Rebels will take the field with plenty of optimism. Newtown Spirit women have a bye this week but their players will be there to cheer their fellow players on. With an uplifting win last week to their credit, the D2 Men Newtown Spirit will take on Corio at 3.30 pm, with even more determination and effort. To round off a day of great hockey, stay around for the two games at 5.00 pm. The D2 Men Newtown Strikers are up against Geelong White. Having just had their first loss for this season, the Strikers team will be keen to bounce back and show that they can maintain top spot on the ladder. The D1 Men’s match will be an exciting contest between the 2014 Grand Final participants – Newtown Falcons and Torquay, so it should be a very exciting match, and an excellent opportunity to see some fast hockey with silky skills and teamwork. With the 2015 season nearly halfway through, these matches could well be a taste of what the finals will be like. Come along and be part of the action and the excitement of Newtown Hockey.